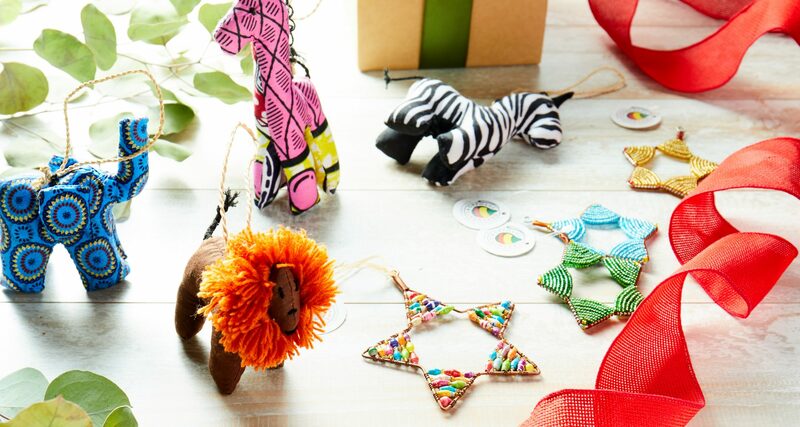 by Courtney Wissot for Thrive Market Whether they’re family heirlooms, travel souvenirs, or handmade by your kids, ornaments are among the most personal holiday decorations we put up every December. Some ornaments, however, have an even deeper significance: They change lives. Ornaments4Orphans® (O4O), is an organization that pays East African artisans—including disabled men and widowed women—a fair, reliable wage to handcraft ornaments and other accessories. It’s a dream come true for husband-wife team Scott and Jamie Laslo, who started O4O in 2010. The idea came together after the Laslos spent years working with a non-profit orphanage in Uganda. The charity dollars they helped raise went toward supporting orphaned children, but the work wasn’t getting at the root of the problem—that is, preventing kids from becoming orphans in the first place. “Kids age 18 and younger make up more than half the world’s population,” Scott says. UNICEF estimates there are some 140 million orphans worldwide, and these children are at risk for abandonment, trafficking, exploitation, abuse, starvation, and psychological disorders. A parent’s death is only one way a child can become orphaned. Some are abandoned due to a lack of resources, when parents are unable to care for their family’s basic needs. By providing higher wages and steadier employment for people living in vulnerable communities throughout Africa, O4O helps lower the chances of poverty for adults and their children, and in turn generations to come. “Artisans are able to send their children to school,” says Scott, “which is slowly going to help these countries climb out of poverty. It’s really incredible to see it happening.” Take for instance Yeko, one of roughly 150 artisans working with O4O. A Ugandan artist who was disabled by polio at a young age, Yeko is now able to support himself and his family by paying rent, providing food, affording medicine, and sending his children to school. His ornaments—made from bark cloth, natural grasses, and recycled materials—are sold on Ornaments4Orphans’ site to collectors and holiday enthusiasts around the world. Currently, Ornaments4Orphans® artisans are able to earn up to $5 a day—over double the estimated $2 per day made by more than 10 percent of the world population, according to the World Bank. To support this mission (and trim your tree), head over to Thrive Market to find an extra special ornament to decorate your home this holiday season!